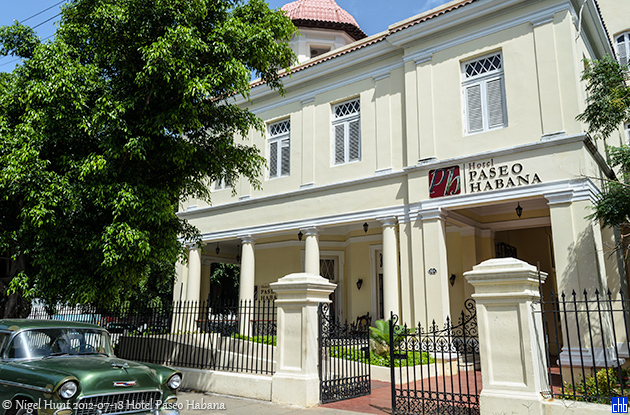 The recently (2010) renovated Paseo Habana Hotel is in a quiet residential street in leafy Vedado. Not an obvious billet for the average international tourist. But actually the rather atypical location might make it a fun spot from which to discover some of the 'real Havana'. In 2017 and 2018, Hotel Paseo Havbana was managed by the Spanish Hotel company Sercotel and during this time the hotel went through some rennovation works. 30 air-conditioned rooms with private bathrooms, 4 of which are wheelchair accessible. Vedado's heart is along and around La Rampa. This is where Avenida 23 meets the coastal road, the Malecon, and you will find the rather impressive Hotel Nacional de Cuba. Infront of the Hotel Nacional is La Piragua, "The Dugout", where each Saturday afternoon various car and motorcycle club piston heads show-off their gleaming chrome classics. On La Rampa itself you will find the Cubana (airline) main office, many shops, markets, hotels, restaurants and nightclubs. Directly east on Calle San Miguel between calles Ronda and Mazon is the fine Museo Napoleonico, this mansion is house of a remarkable collection of Napoleonic memorabilia. Vedado's top sight is perhaps the Cementerio de Cristobal Colon.